The copy constructor lets you create a new object from an existing one by initialization. A copy constructor of a class A is a non-template constructor in which the first parameter is of type A&, const A&, volatile A&, or const volatile A&, and the rest of its parameters (if there are any) have default values. A value parameter is initialized from its corresponding argument. An object is returned by a function. Copy constructor needs to overridden to support deep copy, if copy constructor is required then it requires a destructor and needs to override assignment operator as well. If the object has no pointers to dynamically allocated memory, a shallow copy is probably sufficient. Therefore the default copy constructor, default assignment operator, and default destructor are ok and you don't need to write your own. C++ treats variables of user-defined types with value semantics. This means that objects are implicitly copied in various contexts, and we should understand what "copying an object" actually means. person b(a);   // What happens here? b = a;         // And here? 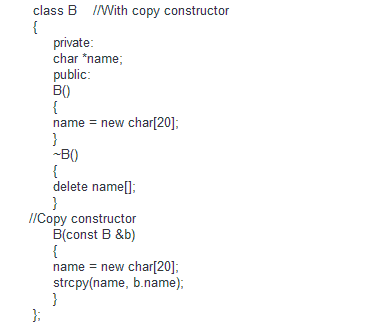 The implicitly-defined copy constructor for a non-union class X performs a member wise copy of its sub objects. The implicitly-defined copy assignment operator for a non-union class X performs memberwise copy assignment of its sub objects.